Treatment of maxillary incisor with an associated cystic lesion by conventional endodontic therapy combined with decompression is reported. Although small cystic lesions frequently heal simply with endodontic therapy, larger lesions may need additional treatment. In some cases, when surgical enucleation is elected, there is a chance for inadvertent injury to adjacent teeth or structures even though periapical surgery has a role in endodontics. Therefore a more conservative approach of decompression and a workable protocol for this was attempted with success and is presented here. Conventional non surgical root canal therapy is the treatment of choice in management of teeth with large periapical lesions. When this treatment fails in resolving the periradicular pathosis alternative strategies like nonsurgical retreatment or periapical surgery must be considered. In case of very extensive lesions, as there is a chance for inadvertent undesirable consequences when surgical curettage is done, the procedures like Marsupialization or tube decompression are indicated. Marsupialization is a surgical decompression procedure used to reduce large periapical lesions without periapical curettage. Decompression allows continuous drainage from periapical lesion, which eliminates conditions favoring expansion of periapical pathosis resulting in healing by osseous regeneration. Hence this paper is to discuss conventional management of large periapical pathosis without surgical curettage. A 21 year old male Patient came to Dental office with a chief complaint of swelling in the upper front tooth region both front and behind the teeth for the past 6 months. Patient had history of childhood accident. He revealed that when the pus gets collected the swelling increases in size and then discharges through palatal aspect. Once the pus is discharged the swelling subsides and then recurs after some days. The intra-oral examination revealed two swellings in the labial vestibule in relation to 11, 12 and 21, 22 regions and size of 2×2 cms and 3×2cms respectively with discoloration of 11 [Figure 1]a. Swelling is also seen in the palatal region extending from 13 to 23 regions and is of size 4×3 cms [Figure 1]b. The swellings were soft and fluctuant in nature. Electric and thermal pulp vitality testing showed negative response in 11, 12 and 21 while adjacent teeth showed normal response. Teeth were painless to vertical percussion. 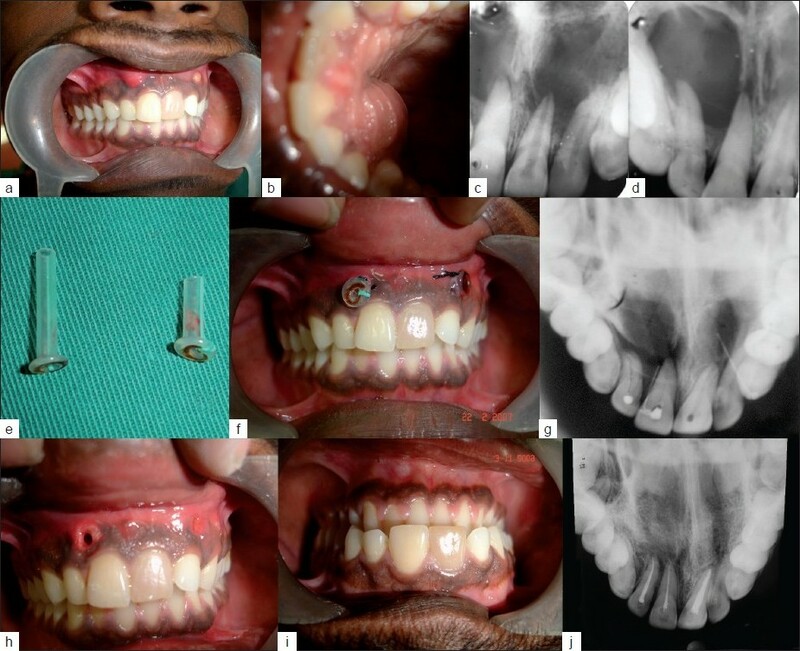 Initially an IOPA was taken to know the extent of lesion which revealed a lesion involving periapical region of 11, 12 and 21, 22 regions respectively [Figure 1]c and d. The extent of periapical radiolucency was 3×4 cms and 4.5×5cms. A fine needle aspiration of the swelling revealed a discharge containing pus and blood. A presumptive diagnosis of infected radicular cyst in 11, 12 and 21 was made. Root canal treatment of 11, 12, 21 and surgical decompression in periapical region was planned. Lignocaine with 2% Adrenaline was administered. Access opening, pulp extirpation, working length determination, cleaning and shaping was done in 11, 12 and 21. Calcium hydroxide intracanal medicament was given for a week and then obturated. A 1.5cms vertical incision was made with BP blade no 15 at the mucoperiosteum between root eminences of 11, 12 and 22, 23 respectively, the surgical site was irrigated with saline and deep curettage was done to remove granulation tissues. A radiopaque flanged cannula of length 2.5 cms on right quadrant and 4cms length on left quadrant were inserted into the depth of the cavity [Figure 1]e. Two interrupted sutures were placed to stabilize the drain on either side [Figure 1]f.
A Radiograph was taken to confirm the position of the cannula. The patient was recalled after 48 hours for irrigation with normal saline and sutures removed, adjustment of cannula for tissue comfort was done [Figure 1]g and h. The patient was instructed to perform self irrigation of the lesion with normal saline using plastic syringe and needle after removing the cannula. The patient was instructed to contact the dentist immediately if the cannula cannot be reinserted. Patient was recalled every fortnight to monitor the length of cannula. After 7 weeks the drain was removed with instruction to continue irrigating the aperture. Two weeks later healing was nearly complete [Figure 1]i. The patient was recalled after 1 year and occlusal radiograph was taken to evaluate periradicular healing [Figure 1]j. 1. Walton RE, Torabinejad M. Principles and practice of endodontics. 3 rd ed. St Louis, Missouri: WB Saunders Co; 2002. 10. Toller P. Permeability of cyst wall in vivo: Investigation with radioactive tracer. Proc R Soc. Med 1966;75:652-62. 11. Tartman EK. Diffusion as a factor in the increase in size of dental and dentegerous cysts. Br Dent J 1939;66:515-20. 13. Stokke T. Osmotic pressure in odontogenic cysts. Acta Odontol Scand 1956;14:65-78. 14. Gutmann JL. Decompression: Reduction of large periradicular lesion surgical endodontics. 1 st ed. Ishiyaku EuroAmerica, Inc. USA 1999. p. 397-406.